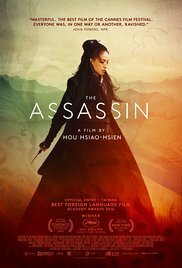 Storyline:  The Assassin (2015) In 8th century China, 10-year-old general's daughter Nie Yinniang is handed over to a nun who initiates her into the martial arts, transforming her into an exceptional assassin charged with eliminating cruel and corrupt local governors. One day, having failed in a task, she is sent back by her mistress to the land of her birth, with orders to kill the man to whom she was betrothed - a cousin who now leads the largest independent military region in North China. After 13 years of exile, the young woman must confront her parents, her memories and her long-repressed feelings. A slave to the orders of her mistress, Nie Yinniang must choose: sacrifice the man she loves or break forever with the sacred way of the righteous assassins.